Since their debut, the Diamondbacks have won five NL West division titles, one NL pennant, one Wild Card game, and the 2001 World Series. On October 18, 2012, the team announced that Bob Brenly would be returning as a broadcaster to replace Grace, and that he would be joined by then-ESPN personality Steve Berthiaume. ^ a b Gilbert, Steve (December 3, 2015). "D-backs wow with cutting-edge new uniforms". Dbacks.com. MLB Advanced Media. Archived from the original on December 6, 2015. Retrieved July 25, 2018. ^ "Organization" (PDF). 2018 Arizona Diamondbacks Media Guide. MLB Advanced Media. April 24, 2018. Retrieved July 25, 2018. ^ "Baseball Expansion Teams Put in Leagues". Southeastern Missourian. January 17, 1997. ^ a b c "D-backs shed their skin after unveiling new uniforms, colors on runway" (Press release). Arizona Diamondbacks. November 8, 2006. Retrieved December 4, 2015. ^ Gilbert, Steve (November 8, 2006). "D-backs unveil new colors, new look". Arizona Diamondbacks. Retrieved December 4, 2015. 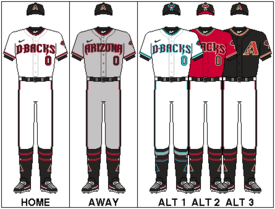 ^ "Arizona Diamondbacks 2016 Uniforms". Arizona Diamondbacks. December 3, 2015. Retrieved December 3, 2015. ^ Axisa, Mike (December 4, 2015). "LOOK: Diamondbacks unveil seven new uniforms for 2016". CBSSports.com. Retrieved September 9, 2017. 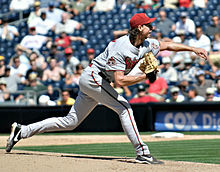 ^ "Sutton to broadcast Diamondbacks games on D-backs TV network, FOX Sports Net Arizona through 2011". Arizona Diamondbacks. November 1, 2006. Retrieved December 9, 2015. ^ "FSN Arizona to become exclusive TV home for the D-backs starting next season" (Press release). Arizona Diamondbacks. July 13, 2007. Retrieved December 9, 2015. ^ Piecoro, Nick (June 27, 2012). "Arizona Diamondbacks SS Stephen Drew's ankle holds up". The Arizona Republic. Retrieved November 9, 2012. ^ Boivin, Paola (August 24, 2012). "Arizona Diamondbacks hit hard again in the public eye". The Arizona Republic. Retrieved November 9, 2012. ^ Merrill, Laurie. "Mark Grace indicted on 4 DUI counts". The Arizona Republic. Retrieved November 9, 2012. ^ Piecoro, Nick (October 4, 2012). "Diamondbacks announce Mark Grace and Daron Sutton will not return to the broadcast booth". The Arizona Republic. Retrieved December 9, 2015. ^ Piecoro, Nick (October 18, 2012). "Arizona Diamondbacks name Steve Berthiaume, Bob Brenly as TV announcing team". The Arizona Republic. Retrieved November 9, 2012. ^ "Broadcasters". MLB.com. Retrieved July 16, 2018. ^ Piecoro, Nick (January 22, 2009). "No Spanish TV broadcasts for D-Backs". The Arizona Republic. Retrieved December 9, 2015. ^ "Johnson, Randy". Baseball Hall of Fame - Hall of Famers. Retrieved July 27, 2016. ^ "D-backs All-Time Leaders". Arizona Diamondbacks. Retrieved December 9, 2015.